He married Francis Vlasta Machala2,3,7 [Val Machala6,7], Sep 4 19482,3,7, Berwyn, Cook County, Illinois2,3,7. Francis, daughter of Frank Machala & Marie Ka'bela2,3,18,19, was born Jul 18 19232,3,18,19 [Jul 19 192314,16], Cicero, Cook County, Illinois2,3,18,19. Columbia lost a vocal community activist Thursday when the car her husband was driving collided with another vehicle on Highway 63 at Dripping Springs Road, north of Columbia. Val Hinshaw, 79, of 5008 Paris Road was pronounced dead at the scene about an hour after the 5:35 p.m. wreck, said Assistant Chief Doug Westhoff of the Boone County Fire Protection District. The Missouri Highway Patrol, which investigated the wreck, could provide no detailed information about the collision as of last night. But Westhoff, who was among emergency workers who responded, said that the positions of vehicles after the collision indicated that the victim’s husband, Harold Hinshaw, 85, had turned off northbound Highway 63 to turn left on Dripping Springs. Information from the patrol indicated Timothy Schoonover, 25, of Green City was driving southbound on Highway 63. Westhoff said Schoonover’s car struck the passenger side of Hinshaw’s car. Westhoff said the impact forced the Hinshaw vehicle off the road. After the Schoonover car came to rest on the southbound lanes, Westhoff said, another vehicle struck it but that driver was not injured. A passenger with Schoonover, his wife Carey, was injured and taken by helicopter to University Hospital. Westhoff said that she was pregnant. Harold Hinshaw also was taken by helicopter to University Hospital for treatment. Timothy Schoonover refused medical treatment at the time. Each of the injured people was released after treatment. Val Hinshaw was active in the community. She supported a variety of causes as a member of the Columbia Public Schools board from 1970 to 1976, the Social Concerns Committee of the Missouri United Methodist Church, the Interfaith Peace Alliance and the Mid-Missouri Peace Coalition. Over the years, news reports and acquaintances indicated, she organized rallies against racial and sexual discrimination, the introduction of junior ROTC into the Columbia schools, the sale of Boone County Hospital and the U.S. military action in Iraq. She also dedicated much of her time to a prison ministry and drove children to visit their parents in jails. "Many people, when they reach her age, pull back from community involvement," said Mark Haim, director of Mid-Missouri Peaceworks. "She approached the concerns she had with a vigor and intensity that matched many of the younger people she worked with." Robert Cook, a member of Hinshaw’s church, paid a tribute to Hinshaw. "I could hardly picture the woman without a smile on her face and a petition in her hands," he said. Vlasta "Val" Machala Hinshaw, 79, of Columbia died Thursday, Dec. 19, 2002, in Columbia. Services will be at 3 p.m. Sunday, Dec. 29, at Missouri United Methodist Church, 204 S. Ninth St., with the Rev. Jim Bryan officiating. She was born July 18, 1923, in Cicero, Ill., to Francis and Marie Kabela Machala. She married Harold Hinshaw on Sept. 4, 1948, in Cicero, and he survives. She overcame childhood polio. She graduated from the University of Wisconsin-Madison. 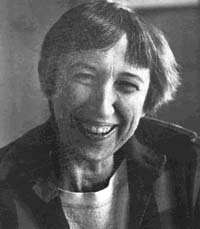 She taught at the University of New Mexico-Albuquerque and at Stephens College in Columbia. She was active in parent-teacher organizations and was elected to the Columbia School Board in 1970 and served two terms. She had been involved in politics and the League of Women Voters. Mrs. Hinshaw was a member of Missouri United Methodist Church and had served in district and conference leadership positions. She was active in United Methodist women’s organizations, social justice groups and Church Women United. She organized the SERRV Traveling Global Market and held SERRV sales in many churches around Mid-Missouri. She was active in the Inter-Faith Peace Alliance and the Peace Coalition. She participated in PATCH, Habitat for Humanity, CROP Walks, FISH, RAIN, Pinnacles youth group, Boy Scouts, Girl Scouts, 4-H, Meals on Wheels, Columbia’s Senior Center, Salvation Army and many other service organizations. She was involved in issues such as equal access to sports facilities for female students, the Missouri Sunshine Law, anti-gambling campaigns and efforts to keep local ownership of Boone Hospital Center. Survivors also include a daughter, Mary Ann Dana of San Antonio; six sons, David Hinshaw of Santa Monica, Calif., Frank Hinshaw of Honolulu, Tom Hinshaw of Indian Head Park, Ill., John Hinshaw of Lebanon, Pa., and Paul Hinshaw and Peter Hinshaw, both of Columbia; and 11 grandchildren. She was preceded in death by her parents and two brothers, Frank Machala and George Machala. Memorials are suggested to PATCH or SERRV in care of Missouri United Methodist Church, 204 S. Ninth St., Columbia, Mo., 65201. On the first page of one of Val Hinshaw’s well-worn Bibles is a quotation she inscribed herself: "Nothing worth doing can be done by one person." But that doesn’t mean she didn’t try. "She wanted to make the world a better place," said her son Peter Hinshaw. "She saw needs everywhere, and she knew a single person could make a difference." Vlasta "Val" Machala Hinshaw of Columbia died Thursday, Dec. 19, 2002, in a car accident. She was 79. Mrs. Hinshaw was born July 18, 1923, in Cicero, Ill., to Marie and Frank Machala. Her uncle, Joe Machala, helped raise her after her father died. After graduating from the University of Wisconsin-Madison, Mrs. Hinshaw began teaching physical education at the college level. While teaching at Stephens College in 1948, she met Harold Hinshaw, who had recently returned from serving in the Army. They were married Sept. 4, 1948, in Cicero. While her children were still in school, she was active in such organizations as the Boy Scouts and the PTA, Peter Hinshaw said. Mrs. Hinshaw served two terms on the Columbia Board of Education in the 1970s. She later became involved in social justice issues. "As she got older, she managed to keep her energy," Peter Hinshaw said. "Whereas a lot of people wind down, she wound up." Mrs. Hinshaw was an active member of the Missouri United Methodist Church. "She has nurtured me in the Christian faith," said Mickey Havener, an associate pastor at Olivet Christian Church who knew Mrs. Hinshaw for 28 years. Havener praised Mrs. Hinshaw’s efforts in the church. "Church is more than committees," Havener said. "As our faith gets stronger, we really need to get in there and do something. Worship is important, but our worship should lead us out to reaching out to humankind. Whenever she saw humanity in need, she did everything she could to make a difference." Mrs. Hinshaw participated in dozens of local and international organizations, including Parents and Their Children, an organization she helped create that brought children together with their incarcerated parents; the Columbia Interfaith Peace Alliance; Habitat for Humanity; the Regional AIDS Interfaith Network; Meals on Wheels; 4H; Pinnacles Youth Group; and Sales Exchange for Refugee Rehabilitation Vocation International, a nonprofit trade organization that markets products made in developing regions of the world. She often participated in Mid-Missouri Peaceworks' Saturday morning anti-war vigils at the post office, where she carried a 36-by-24-inch sign that read "No." "She was pretty much busy all day, every day," Peter Hinshaw said. "Her biggest thing, her hottest concern, was peace - to raise awareness, to try to get people to see that war doesn’t have to be inevitable." Peter Hinshaw said his mother’s greatest accomplishment was "living her faith and being an inspiration to other people." "She never met anybody that wasn’t her friend," he said. "She fought for the underdog constantly. If there was somebody who didn’t have a coat, she’d give them hers. She wanted to help anybody in need." A service to celebrate Mrs. Hinshaw’s life, officiated by the Rev. Jim Bryan, is scheduled for 3 p.m. Sunday at Missouri United Methodist Church, 204 S. Ninth St.
Mrs. Hinshaw is survived by her husband; her sons, David Hinshaw of Santa Monica, Calif., Frank Hinshaw of Honolulu, Paul Hinshaw and Peter Hinshaw, both of Columbia, Tom Hinshaw of Indian Head Park, Ill., and John Hinshaw of Lebanon, Pa.; her daughter, Mary Ann Dana of San Antonio; and 11 grandchildren. Her parents and two brothers, George and Frank Machala, died earlier. The family requests that memorial contributions be made to SERRV through the Missouri United Methodist Church, 204 S. Ninth St., Columbia. EDITOR’S NOTE: Val Hinshaw wrote a letter to the editor last week, which is published on page 7A of today’s edition of the Missourian. Editor, the Tribune: Thank you for publishing "Holiday season should echo Christ’s message of peace" by Val Hinshaw on Friday. You might not have known that she died a day earlier, last Thursday, in a car accident. She was a wonderful woman who gave her life for others as a friend, mentor, advocate and community leader. One goal of her life was that all people should be treated justly and that human life is to be treasured. As a tribute to her, I would echo her plea that we all consider what Jesus would have each of us do regarding the many social concerns in our community and around the world and take action. Thank you, God, for Val Hinshaw, who by her example led and taught many of us to continue to strive for peace for all people. Editor, the Tribune: This was already a season of sadness, and now Val Hinshaw has died. She was a woman of peace, so now peace is less palpable. She stood in decades of vigil lines, an unconfused Christian whose gospel denounced warfare and state executions. The world would be better if it had paid her more notice. There is a void in the vigil lines now, and the world blunders on its way. She prayed in the mosque, in the temple and in all the churches - a cracking voice asking for insight. Now her wisdom is silent like an escaping wisp of incense. The Klu Klux Klan came to Hillsboro on July 8, 1995, a year that hard times fell upon Missouri. The people of Jefferson County had been hit harder than most, and the Klan hoped to brew hatred from the unemployment and despair. On that same morning, Val Hinshaw and a band of small parishioners from Community United Methodist Church began their three-hour drive to Hillsboro to protest the rally. The trip would take the group across a major interstate and through narrow, two-lane country roads - a strenuous drive for a 72-year-old woman. But it was Hinshaw’s car, the ’84 Chevy Caprice she had driven everywhere spreading the message of peace and tolerance, that would be the one in front quietly but steadfastly steering others in the direction they wanted to go, just as Hinshaw did with the issues she supported. Hinshaw, 79, had taken her last ride in that Caprice a week ago when the car, driven by her husband, Harold Hinshaw, was broadsided by another vehicle off Highway 63 north of Columbia. She was pronounced dead at the scene. Friends and relatives paid tribute to her memory yesterday during a brief service at Missouri United Methodist Church. With Hinshaw’s passing, Columbia lost one of its most committed activists and public personalities. Unlike many whose social consciousness formed during the tumultuous 1960s and ’70s, Hinshaw’s passion and faith in the liberal ideals of the era never waned, said friends, relatives and fellow activists. Carl Schenck, a former senior pastor at Hinshaw’s church, described her as the "classic old-school activist," a person who tackled a variety of issues as part of a liberal agenda that emphasized peace, social justice and racial equality. The dogmatism, however, often came in a sugar-coated form. "To say no would have been like going against motherhood and apple pie." Hinshaw’s political beliefs developed over five decades. She was born July 18, 1923, one of three children of an immigrant family in Cicero, Ill., a town bustling with Czechoslovakians. According to cousin Rosemary Jack, Hinshaw’s mother, Marie Machala, was a strong-willed woman who had traveled to America alone. Like Hinshaw, her mother digested a regular diet of news and kept active in her community through Czech social organizations called "sokals," Jack said. David Hinshaw, the oldest of Hinshaw’s seven children, said his mother became exposed to radical leftist ideology at the University of Wisconsin-Madison. Fears of communism had not evolved into the Red Scare of the early ’50s at the time, and students would regularly meet at the student union to drink beer and discuss Marx and Trotsky, he said. My mother "never told me where her sympathies were," David Hinshaw said, "but she was politically aware enough to know the discussion was going on." However, it was the events of the ’60s and ’70s that forged his mother’s social and political consciousness, David Hinshaw said. At the time, the family discussed the Vietnam War and other social issues regularly at the dinner table. It also was at that time, David suspected, that his mother began to combine her deeply-held belief in a compassionate Christianity with a liberal democratic ideology. That fusion of beliefs sparked a three-decade commitment to social causes that would manifest itself in a variety of activities, including protests against the leasing of Boone Hospital Center, the sale of international crafts to make money for Third World laborers, shuttling of children to prisons to visit parents who were inmates and regular peace rallies opposing war with Iraq. "With respect to her beliefs, she didn’t tell people how to act. She was an example," said another son, John Hinshaw. With my mother gone, "you lose somebody who doesn’t just talk the talk, but also walks the walk." Harold Clyde Hinshaw, 90, of Columbia passed away Saturday, Feb. 9, 2008. Celebration services will begin at 12:30 p.m. Sunday, Feb. 17, in McMurray Chapel of the Missouri United Methodist Church at 204 South Ninth Street with a holy service of the Masonic Lodge. Visitation will be at 1 p.m. in the main floor parlor adjacent to the sanctuary. At 2 p.m., the Rev. Jim Bryan will officiate in the sanctuary of the Missouri United Methodist Church. Burial and military honors will be private. Harold Clyde was born Aug. 21, 1917, to Clyde Herbert Hinshaw and Enna Louise Hendrix Hinshaw on a farm in Englewood, with the help of their neighbors, the Logans. His great-grandfather, Amos Hinshaw, as well as his brother, Abel, navigated up the Missouri River from Ohio after the Civil War. They initially settled south of Columbia in Claysville but, due to frequent flooding, resettled on a farm at the base of the Devil's Backbone on Cedar Creek in Englewood. Harold was an incredibly hard worker from an early age. Starting when he was 5, one of his chores was to walk to his grandfather's house a mile away to run errands such as carrying buckets of milk. As a child, he amazed others as he broke horses. Although slight in build, he had incredible physical strength. As a young man, working in his father's feed store during the Depression, he could carry a 50-pound bag of feed in each arm. At times he drove a truck daily to either St. Louis or Kansas City to the feed mills and developed an uncanny sense of direction. He never lost his appreciation for hard, physical work - "real work," he termed it. Into his 60s he could throw hay bales from the back of a truck unerringly up a story into the side door of a barn. Well into his 80s, cutting firewood, spreading gravel by the shovel full off the back of a dump truck and mowing grass remained some of his favorite pastimes. In 1941, immediately after Pearl Harbor, he joined the U.S. Army, serving in the 246th Combat Engineers. He joined the service as a relatively old man of 25, and quickly rose through the ranks to become a Master Sergeant. He was referred to as "the old man" by the 18-19-year-olds. Many of the men he served with looked up to him as the man who kept them safe and tried to keep them warm and dry during wartime. In 1942, he was among the engineers the Army began dropping off in the freezing woods with trucks, saws and tents to help build the Alaskan highway. That endeavor left him a bitter opponent of camping and cold weather in general. His unit followed the D-Day invasion on D+4 and served in the Battle of the Bulge. Like most combat veterans, those were experiences he never did discuss. At reunions, even 50 years later, they loved and respected him and his best friend, Sgt Dascolli. When he returned home to Columbia in 1945, he was eager to become a family man. He married Vlasta Machala, then a teacher of Physical Education at Stephens College. He returned to work at his father's feed store, finished his degree in business at the University of Missouri through the GI Bill and started a family. Ultimately, they had seven children and a dozen grandchildren. Throughout his life he remained a small businessman, buying his father's feed store in the 1950s. He ultimately went into real estate where he enjoyed his greatest success. He was an active adult leader in 4-H and the Boy Scouts of America. He was President of the Downtown Optimist Club in 1971-1972 and a past President of the United Methodist Men at Missouri United Methodist Church. 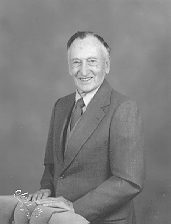 He served on the boards of The Salvation Army, the Pinnacles Youth Park, and the Boone County Fair Board. He was an active member of the Gideon's Camp of Columbia and enjoyed storing Bibles for them. His hobbies included farming, fishing and square dancing. He is survived by his children, David Hinshaw and wife Melanie of Santa Monica, Calif., Frank Hinshaw and wife Mary of Honolulu, Hawaii, Paul Hinshaw and wife Chellie of Columbia, Peter Hinshaw and wife TyAnn of Columbia, Mary Ann Dana and husband Steve of San Antonio, Tom Hinshaw and wife Melissa of Chicago, John Hinshaw and significant other Kerry of Lebanon, Pa.; grandchildren, Margo Hinshaw, John Dana, Paige Hinshaw, Frank "T.K." Hinshaw, Marlie Hinshaw, Alex Hinshaw, Maggie Hinshaw, Sarah & Samuel Dana, Justin Hinshaw, Garrett Hinshaw, and Vlasta Hinshaw; sister, Ruth Lietz; dear cousins, Dorothy Fae Hendrix Sapp and Opal Hinshaw Fewell; and his constant companion the last two years, his dear friend and nurse, Monica McGeorge. 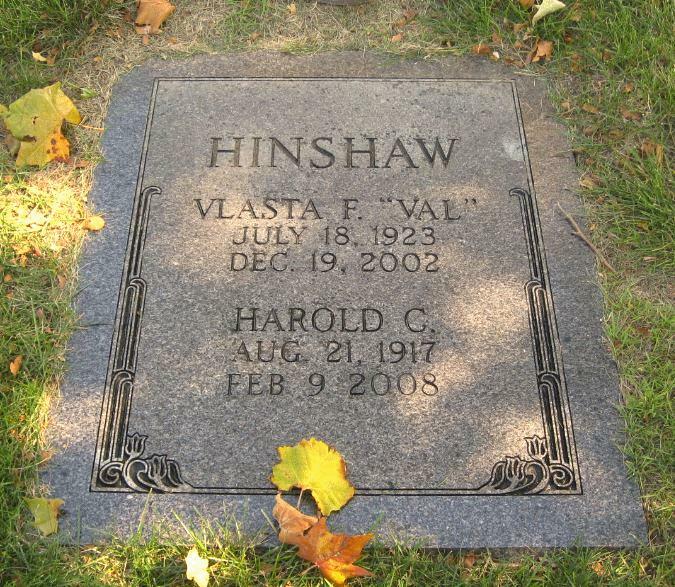 He was preceded in death by his beloved wife of 54 years, Vlasta "Val"; one brother, Frank Hinshaw; and one sister, Ann Hinshaw. The family suggests memorials to The Pinnacles Youth Park, c/o Boone County Extension, 1012 N. Route UU, Columbia, Mo., 65203; Mel West's P.E.T. Project at 1908 Heriford Road, Columbia, Mo., 65202; The Salvation Army at 1108 W. Ash Street, Columbia, Mo., 65203; The Missouri United Methodist Church at 204 S. 9th Street, Columbia, Mo., 65201; or SERRV International at 500 Main Street, New Windsor, M.D. 21776. Online condolences may be left for Mr. Hinshaw's family at www.heartlandcremation.com. Arrangements have been entrusted to Heartland Cremation & Burial Society of Columbia. 442-7850. My Dad was not a whittler. He was as country as they come, which is probably what gave you that idea, but he was not big on the craft aspects of being from the country. He loved to run his tractor around, with or without a wagon, mower, rake, harrow or plow. He converted a cattle feeding trough into a sleigh that he pulled behind his tractor when there was snow on the ground and kids around to ride and play crack the whip at the end of the chain. He loved to walk out on his land and see his cattle and feed them hay or silage or cut a hole in the ice so they could drink when it was below freezing. He was really concerned when they were calving and it was cold outside. He liked to work with wood, but in a grosser way than whittling, either with a chainsaw, ax, mechanical log splitter or, when he was in his prime, with steel wedges and a sledge hammer. When they built the highway through our place in the 1960's, Dad had the construction crews save several trunks of the large walnut trees that were in the right-of-way and had to be felled. Those walnut tree trunks were carefully placed on blocks so they were off the ground and would not rot. They sat that way in what remained of the woods in which they had grown for years, drying and curing for God only knows now what purpose. Eventually Dad reduced his expectations and decided they were fit for his fireplace and he cut the logs into pieces and started splitting those pieces into firewood, by hand. My brother Peter asked if he could have some of the left-overs that were just going to be used for kindling. Those pieces of walnut sat around Peter's back yard for years. After Dad died, Peter got around to sanding them and oiling them. The marks of Dad's wedges remain, but the sanding and oiling that Peter did brought out the beauty of the walnut at last. Melanie and I were each given a chunk of oiled walnut, rough-shaped by my Dad and saved by Peter from Dad's constantly burning fireplace. Contribution from Thomas M. Hinshaw. "Columbia Daily Tribune", Dec 29 2002: http://www.columbiatribune.com. "Columbia Daily Tribune", Dec 21 2002: http://www.columbiatribune.com. "Columbia Daily Tribune", Dec 23 2002: http://www.columbiatribune.com. "Columbia Daily Tribune", Dec 26 2002: http://www.columbiatribune.com. Photo courtesy of Frank Machala Hinshaw.